In a continuing effort to make your relocation to London as easy as possible, here is another in a series of blogs regarding English traditions. It’s been said before and probably not for the last time, but the transition from one country to another ( international relocation ) can be especially trying when you add the challenge of having to adapt to local customs. Fortunately, there are some customs which aren’t necessarily as trying as others. Trying local dishes, for instance, isn’t really as taxing as learning the geography of the new land, foreign to you having just undergone your relocation in London. Cottage pie is a fine example of the ease with which some traditions can be taken up and it’s as traditional an English meal as you’re likely to find. If you’ve never heard of Cottage Pie, it’s basically served in a dish, with mince inside topped with a layer of mashed potatoes and a sprinkling of cheese which is baked in an oven. On chilly winter evenings, it’s the kind of thing which can go down an absolute treat. Another dish you might want to try is toad-in-the-hole, which has sausages baked into a Yorkshire pudding. 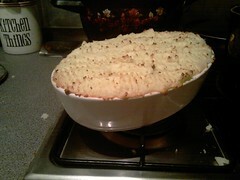 It’s then served with gravy, vegetable and/ or potatoes. As for cakes and desserts, your choice of a new home won’t leave you wanting after your relocation in London. You can add Bread and Butter pudding to the list of things to eat on a cold winter’s evening and served with warm custard, it’s close to a slice of heaven in your mouth. Fruit Crumbles are another treat for your sweet tooth. Apple Crumbling is a perfect example, particularly when it’s served warm with a dollop of cream on the side. The great thing about so much of English cooking after your intnational relocation, is how simple it can be and the ease with which it can be prepared. You’ll find yourself taking on Cottage Pie with ease, as you will with Toad-in-the-Hole. It’s the kind of thing that can make your relocation to London so easy, and you’ll also impress the locals with your knowledge and skill with the local food.